Blanchester quarterback Brayden Sipple takes the snap as Brent Hopkins goes in motion with Destin Ashcraft and James Peters ready to run. 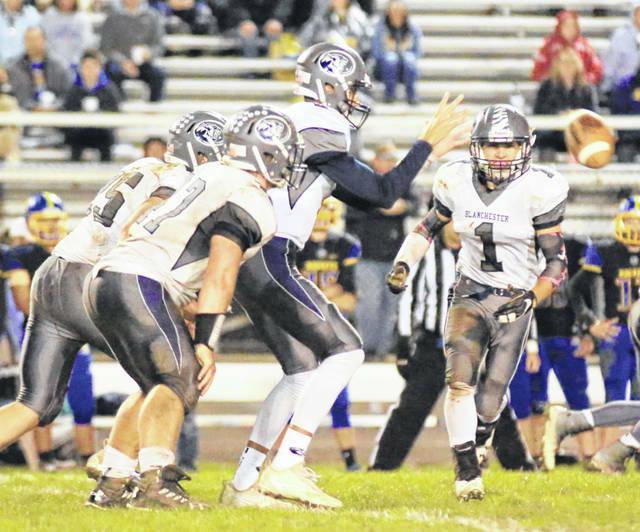 Blanchester can clinch a share of the SBAAC National Division championship Friday night with a win over Fayetteville-Perry. Kickoff at Barbour Memorial Field is set for 7 p.m. This will be the final home game for the BHS seniors. “I’m looking forward to the game and hopeful it will be a great outcome for us and our seniors,” BHS coach Brandon Sammons said. Blanchester defeated Clermont Northeastern 20-0 last week in a game that was the coming out party for the Wildcats defense. While the defense was strong, overall Sammons was not pleased with his team’s approach. Sammons said Adam Frump and Colt Conover have stepped up for the Wildcats as the season has progressed. “This young guy (Frump) goes from giving us good looks on scout team to being a starter and even a two-way starter a couple times for us,” the coach said. “He’s undersized, but has amassed four or five (interceptions) and just understands the game and gets the big picture of how to play and position himself. Sammons said his message this week has been to play your game and not worry about previous scores. “They can think all they want about an opponent, but we all know that until you show it and prove it, it means nothing,” Sammons said. “I think we have an obvious upper hand in this match up. There’s always a little edge when you play a team that has a former student that your players know on it, and with (No. 2) Blake Coffman that is something to watch as well. He’s made some plays for them, and he is familiar with our guys and what we do, so combating that and making sure our terminologies and signals aren’t giving us away will be important too.